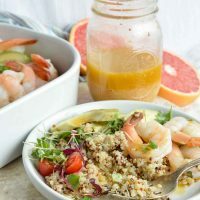 Shrimp Avocado Salad with Quinoa and Grapefruit Dressing is a bright, flavorful and healthy recipe! 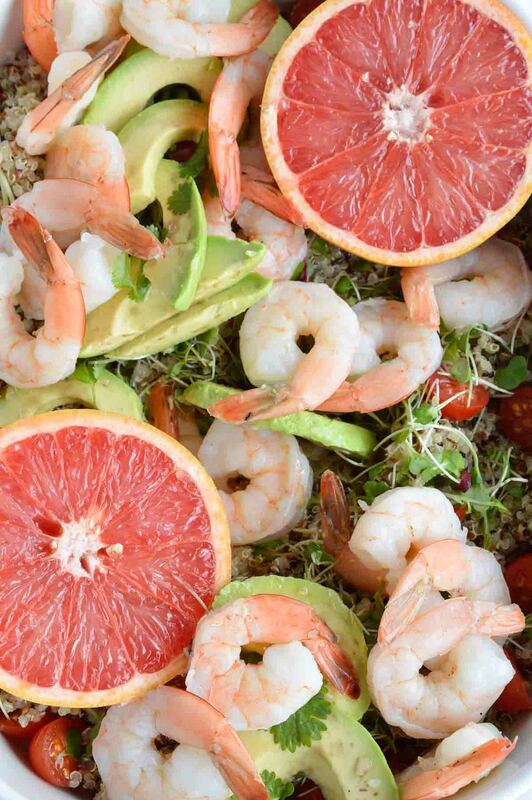 A simple salad made with boiled shrimp, avocados, tomatoes, quinoa, micro greens and homemade grapefruit vinaigrette. “Me Time” is rare for me these days. It seems like life just keeps getting busier and busier. I’m starting to realize that I NEED to make myself take breaks. Just to stop, breathe and relax. When I do take a break from my work, parenting and household responsibilities I enjoy curling up on the cozy couch with a cup of coffee and a couple of my favorite magazines. 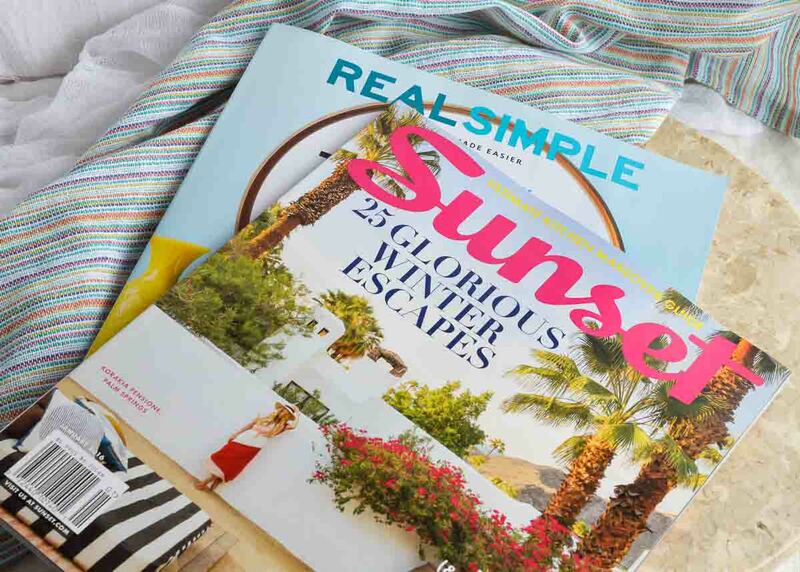 I picked up my Real Simple® and Sunset® Magazines at my local Safeway. They were perfect for a relaxing rainy afternoon. Take advantage of $1.00 off participating titles (PEOPLE®, InStyle®, People StyleWatch®, Real Simple®, and Sunset®) with this digital offer until 2/15/16 while supplies last. 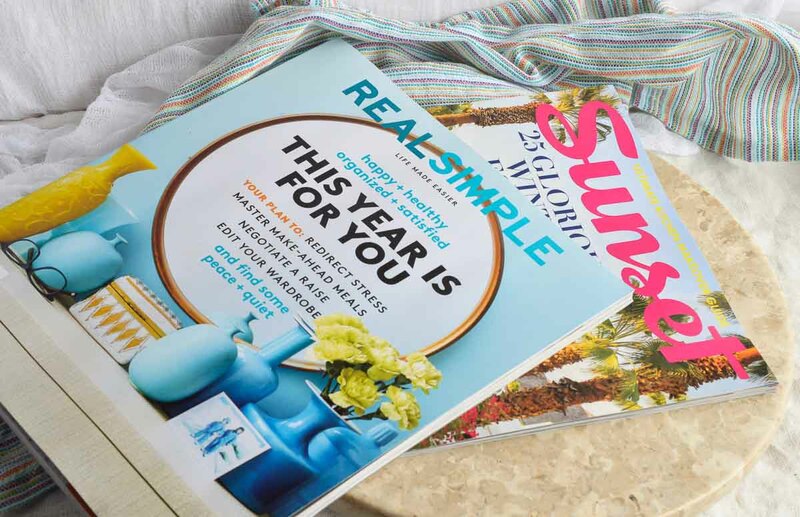 Real Simple® magazine had a feature about grapefruit. I love grapefruit but often forget to use it in recipes. 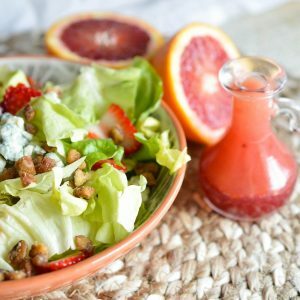 That inspired me to make this Homemade Grapefruit Vinaigrette . . . and it is AWESOME! 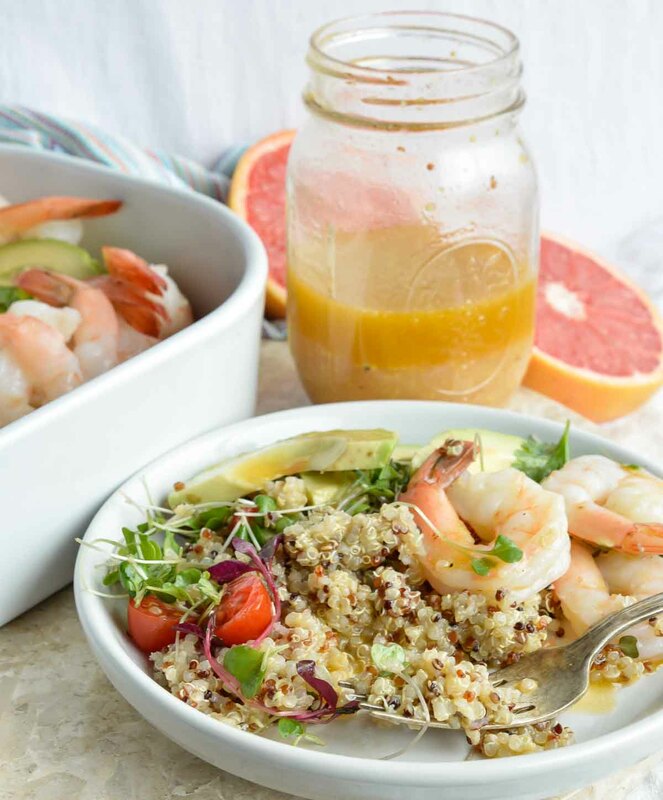 I made a super healthy and satisfying salad with shrimp, quinoa, avocado, micro greens and tomatoes. I could eat this for a meal, like, everyday. Heck, I could eat this twice a day! 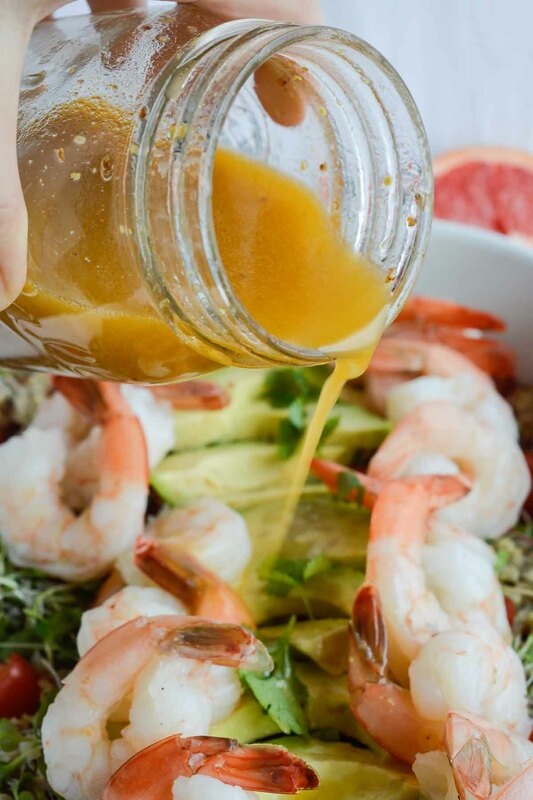 And the flavor and colors in this Shrimp Avocado Salad really brightened an otherwise dreary winter day. So take a little time to relax and recharge yourself. 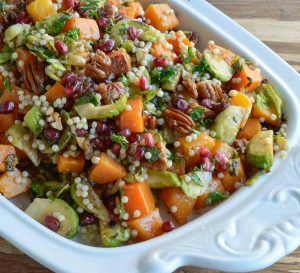 Then take care of your body by feeding it this ultra nutritious quinoa salad! You’ll ditch those winter blues in no time. Combine all dressing ingredients in a glass jar. Secure jar lid and shake vigorously. Drizzle over salad. Arrange all salad ingredients then top with salt and cilantro. 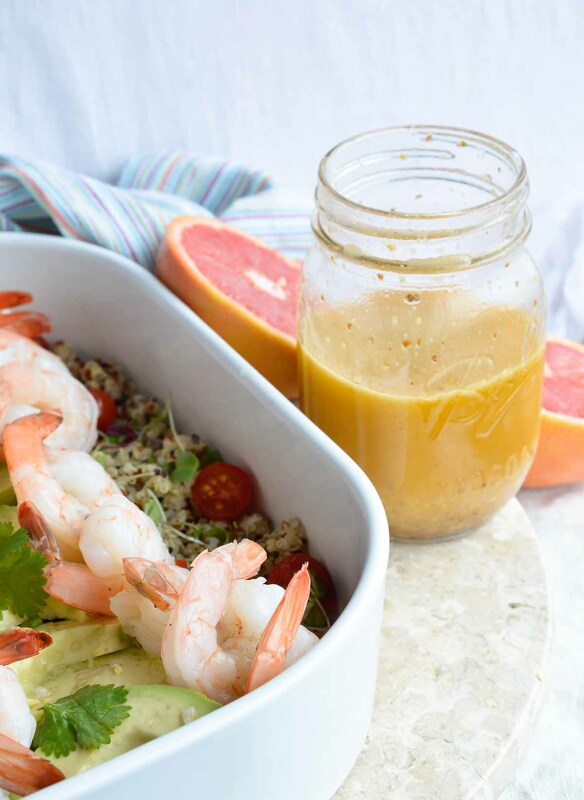 Dress with Grapefruit Vinaigrette. 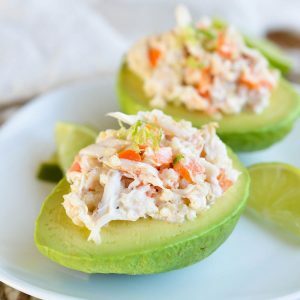 More Bright & Healthy Recipes. . .